يقع فندق Halls Gap Motel، المصمم ليناسب كل الضيوف سواء كانوا من رجال الأعمال أو السياح، في مكان ممتاز في أحد أكثر المناطق تفضيلاً في هولز غاب. يمكن من هنا للضيوف الاستمتاع بسهولة الوصول إلى كل ما تقدمه هذه المدينة النابضة بالحياة. سوف يعشق النزلاء موقع هذا الفندق، فهو قريب من أهم المعالم السياحية في المدينة كمثل ‪The Balconies‬ . إن الخدمات التي يقدمها Halls Gap Motel تضمن للنزلاء إقامة مريحة. إن واي فاي مجاني في جميع الغرف, تخزين الأمتعة, واي فاي في المناطق العامة, صف السيارات, خدمة الغرف هي جزء فقط من الخدمات التي تميز Halls Gap Motel عن باقي الفنادق في المدينة. في Halls Gap Motel غرف نوم يزيد عددها عن 10 صممت بذوق وعناية لتوفر لك كل وسائل الراحة . بعضها يحتوي أضاً على تلفزيون بشاشة مسطحة, اتصال لاسلكي بشبكة الإنترنت (مجاني), غرف لغير المدخنين, مكيف هواء, تدفئة. إن مسارات المشي, مسار جولف - ضمن 3 كم, حديقة هو المكان الأمثل في الفندق للاسترخاء وتفريغ طاقتك بعد نهار طويل. يحظى فندق Halls Gap Motel بموقع ممتاز وخدمات يصعب منافستها. Big and clean room. Spent sometimes talking to the OZ owners Alan and Jenny (hope to get her name right) before we left. 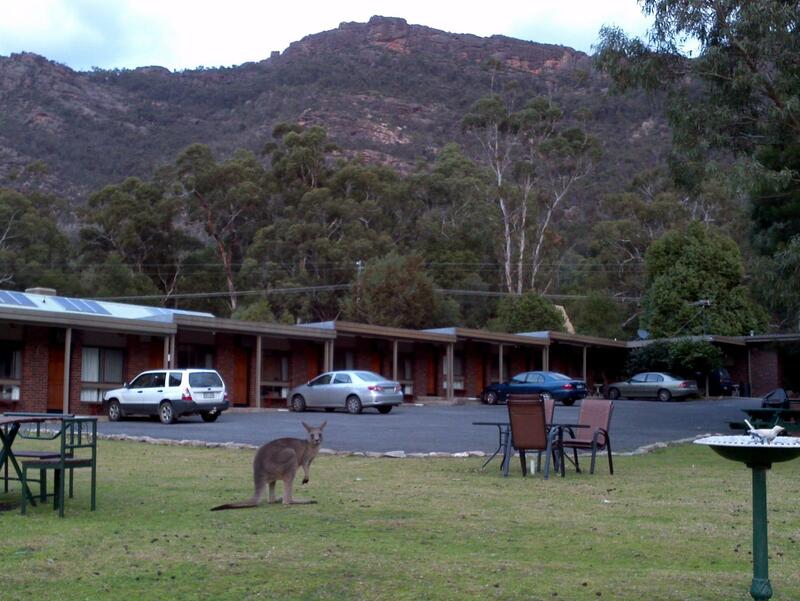 We have a great stay in this motel in Halls Gap, opportunity for close encounter with the Kangaroos right at the back yard. This little gem has everything you need.Great location just passed the shops at halls gap Clean rooms,comfortable bed, cable TV with fantastic reception.I must admit I watched the CI channel a little more than I should have.The fridge has soft drinks chocolates and water if you fancy a snack.It's only a 30 minuet walk to the pub which is also handy.Best of all its only a 1 minute drive to Mt.Victory rd which is the gateway to the major walking and lookout spots the Grampians has to offer.Thank you Vernon and Som for a pleasant stay. Very run down motel. Bathroom walls have spider webs. Headlights above the beds and sofa are dusty. The bathroom space is very small. Not enough tabletop space in bathroom. Read good reviews but overall disappointing. Please read other reviews as this review is not honest and concise. Yes the bathroom is not massive but neither is our price. We never claim to be the Ritz or charge like the Ritz either. Nice location to see wild ducks, kangaroos which is just outside the grass field of the motel. Great for drivers who can park their car just outside the apartment. It would be wonderful if the cutlery set (fork,spoon,utensil) is located inside the room instead of going to get it from another room1. If you have visitors from overseas staying this place is ideal. There are kangaroos right at your door step and a terrific view over the Grampians. The shops are literally a 10min walk and there are great restaurants nearby. Rooms are basic but what do you expect for the price. Owner or Manager was a nice down to earth bloke and in-house food is cheap and good quality. Overall a really nice stay! A good-sized double room. Very clean. Friendly and helpful owner.Room amenities fully adequate. Had nice little raspberry and lemon cookies too! Excellent view of the lake and mountains from outside the room. Kangaroos were hopping around. Good location - a 5-minute walk to all the eateries. Fully enjoyed my stay there! The motel is well located, but the staff is unattentive. They are very fuzzy about you having to leave at exactly 10am and they make sure to repeat it to you at your arrival, it is written on the door in your room and then again someone is coming to knock on people's doors to remind them that if they don't leave by 10am SHARP they will charge 25% for the next half an hour, 50% for the next hour and 100% after the first hour. This attitude for me is ridiculous. You don't need to be reminded those many times and in that awful way. I simply felt unwelcomed. They seemed to be in a hurry to kick you out and overcharge. I was disappointed because the reviews were quite good, but then the place was not really anything special. Hi Shara, We have these policies to discourage over stays as we have to clean rooms for the incoming guests to ensure they can check in on time. Regards, Vern. Great location - near eateries, beautiful lake just outside. Spacious and clean room with coffee/tea and cookies too! Excellent in every respect. And there really were a family of kangaroos in the garden! very clean.better then 5 star hotels.very friendly staff members.room service lady very nice and very helpful.everything near by.kangaroos feeding next to motel.you will have very nice views from motel.very good value for money.they cook nice breakfast and dinner by request. Very standard motel turned out to be very comfortable and with thoughtful touches for guests. Very pleasant seating area with lovely view at bottom of plot. Quiet. Very well placed for exploring the area. I enjoyed a wonderful couple of nights stay at this motel with my family. I chose this place because it seemed it could be somewhere you could spend the day at the motel, and be immersed in nature and wildlife, if you didn't want to go out, or weren't feeling well. I was happy to be right. The view here was wonderful, and there were plenty of wild animals to watch and photograph, from chairs that the owners thoughtfully had set up. I spied: emus, kangaroos, red deer, willy Wagtails, blue wrens, and a number of other birds. The kangaroos actually come quite close, and eat the grass next to the chairs. These are all wild animals, so caution is needed of course. As for my room, I can't fault it. It was spotless, comfortable, and the layout was well thought out. There's no microwave in the room, but there's a communal one for guests to use. All in all, I enjoyed my stay, and highly recommend it for those who are after accommodation from the crowds, or are nature/animal lovers like myself. 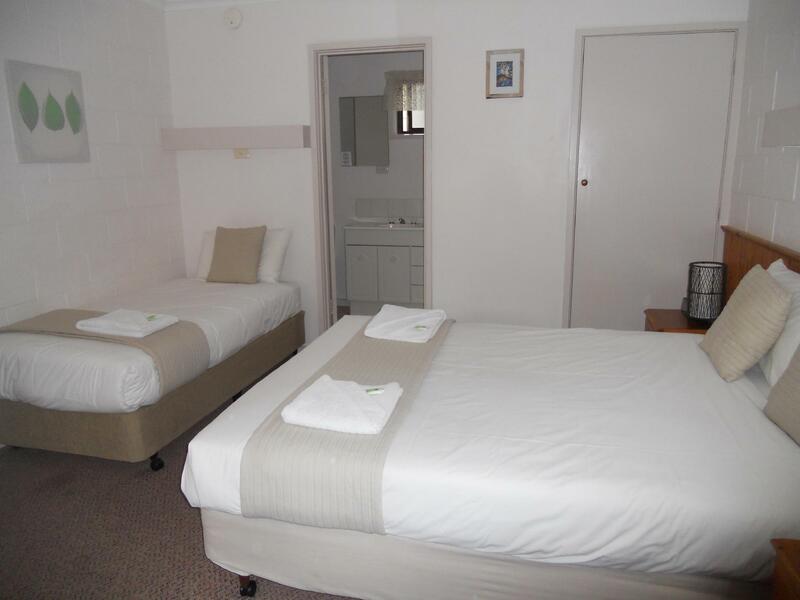 My wife and I rode up to Halls Gap and stayed here on the weekend , this motel is in a great location and the manager was very friendly and helpful with directions to the local pub!! We would defiantly stay here again!!! Free parking right outside your room. Kangeroos roam outside your room in the evenings, quite an eye-opener. Tiny tree frogs were found in our room on a rainy night, toilet lights were flocked with flies. Overall still a great experience with the kangeroos. Thanks for taking the time to give us a great review If you leave the toilet light on all night with the window open the tiny flies will come to the light. Clean and tidy rooms. Perfect place for nature lovers and animal lovers. Had a close encounter with Kangaroos, Emus, Deers, and Cockatoos. 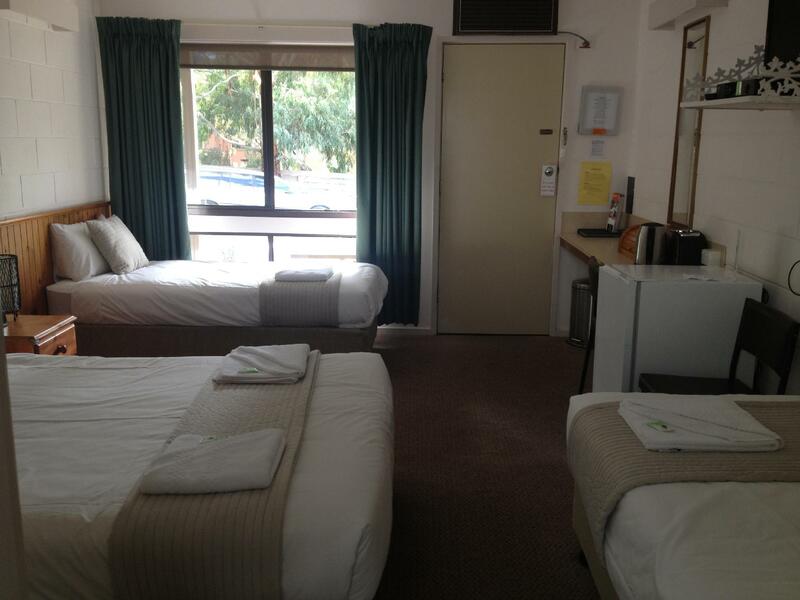 One of the best family getaway experiences & we will certainly stay again at the Halls gap motel when in the Grampians. 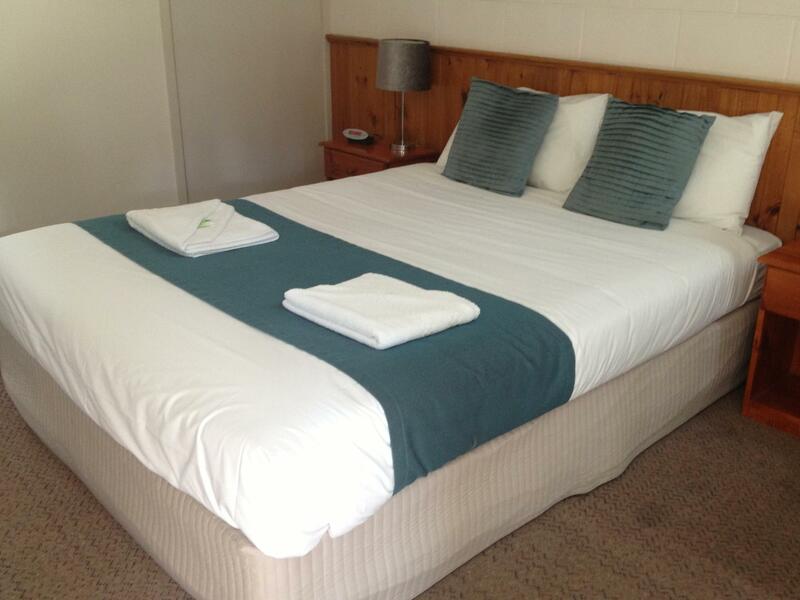 The hotel is well located at the centre of hall's gap, close to the attractions and restaurants. The staff were friendly and helpful. The room itself was comfortable and the bed with mattress warmers were cozy. The place has a nice view of the hill and lake behind. Adequate parking space is available. The only drawback is that there is no kitchen or utensils. Just an oven with a few plates.